Master John has been much less active with his sword through the house since our encounter yesterday. He has instead choosen to spend his time in the courtyard out back playing with his ship on a string in the frozen ornamental pool. 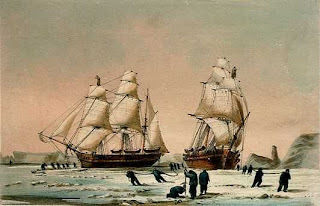 He has taken a large stick and broken the ice into pieces, and is pulling his wooden ship by its string through the ice field. As he slowly pulls the model ship, he shouts commands at the 'sailors', "Get down on the ice there men!" "Put your backs into it boys, we've got to break free!" "Step lively now!" "PULL! PULL!" Occasionally, he pauses to throw a hand-full of rocks at the poor ship, as if being in the ice field weren't trouble enough. Of course it is the duty of any father to find gifts for his children while he is travelling. Additionally, there are others that I wish to find the perfect gifts for that must be considered, and I have a variety of things in mind at present, so to speak. I shall endeavour today to bundle up and leave the Gamble house long enough to purchase the things that I require to send some gifts back home.